Caring for teeth can be difficult for children, and never more so than during a transitional time. The period when baby teeth are lost or when a child receives braces, disrupt a child’s usual routine and can involve some discomfort. The loss of baby teeth is an important milestone in a child’s life and with it can come both excitement and anxiety for your child. A great way to encourage ongoing tooth care is to celebrate and reward this loss and make the event something special that should be prepared for and maintained throughout the process. After the loss of the first two, is a good time to educate your child about the importance of caring for his or her “forever teeth.” Children’s books can be a fun and helpful way of teaching your child about oral care during this time. After the first tooth erupts, have your child gargle with warm water, especially if there is bleeding. Begin wiping the area with a moist washcloth, gently cleaning the area 2-4 times a day, as the exposed gums are more prone to bacterial infection. As more teeth come in, you can switch to a soft children’s toothbrush and establish a routine for brushing around the gums and new teeth. Instruct your child not to brush to hard, so as not to irritate any sensitive areas. Continuing regular checkups with your child’s dentist is extremely essential for not only driving home the importance of keeping with routine dental care even during a static time, but also to show your child how natural this process is, and allow for any fears, concerns, confusion, or questions to be answered by the dentist. 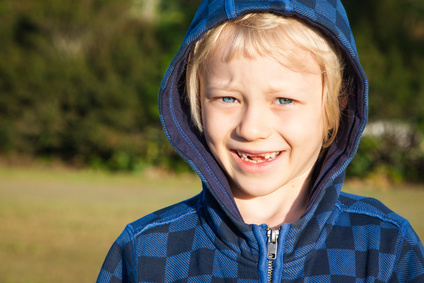 A dental visit during this time can be reassuring for a child who is going through the tooth transition. Some kids will enter this period during late childhood, in which case, it is crucial to order X-Rays and exams to determine tooth placement of emergent teeth and learn whether orthodontic care and/or extractions will be necessary in ensuring a happy, healthy smile. A great way to encourage excitement about this process is to reward the loss of baby teeth and celebrate this time with a game. You should encourage your child to place any lost baby teeth under their pillow at night so the Tooth Fairy can bring them a special surprise. The teeth can then be saved in a glass of water to prevent cracking or hidden by you to keep for when your child is older. Some people like to keep the first tooth and dispose of the rest. Whatever method you choose, celebrate this special time with your child by ensuring they care for their teeth for years to come.